These homeowners chose to improve circulation and visibility by opening up their cooking, dining, and living areas. 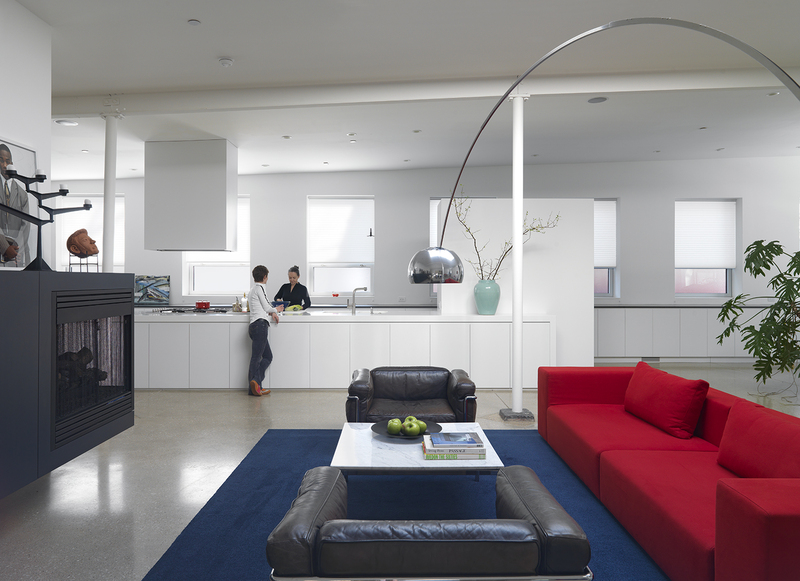 At this office conversion in Chicago, saturation demarcates the line between the primary living space and kitchen in the existing open-plan structure. Were it not for tonal contrasts, aided also by a ground and polished concrete floor, the kitchen would be a virtual whiteout. Located on the second floor of a 1952 building in central Warsaw, a 500-square-foot apartment occupied by Bogusz Parzyszek and his six-year-old son Bartek was gutted and renovated by architect Jolanta Janiszewska. Custom pieces that perform double duty define the streamlined interior, as well as kid-friendly details like swing seats. In Poznań, Poland, mode:lina designers Paweł Garus, Jerzy Woźniak, and Kinga Kin opened up a compact apartment. The renovation, which focused on the living-dining-kitchen area, strikes a balance between intimate and inviting, hence its name: the Open/Private apartment. Sheridan Coakley, owner of the London-based furnishings purveyor SCP, uses his circa-1970s home as a testing ground for the furnishings he carries in his company’s inventory. In the foreground, a Balzac lounge chair by Matthew Hilton is draped with a Donna Wilson blanket. In the open-plan living and dining room, a dramatically sloped roofline allows for generous clerestory windows.